New Delos Release - A Lost World: Schubert - Songs and Duets | Delos Music | Outstanding Classical Recordings for over 40 Years! 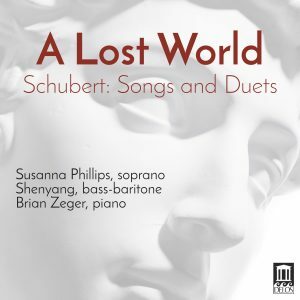 These seldom-heard Schubert lieder—setting verses by German poets including Schiller and Goethe—reflect the Romantic-era’s artistic obsession with the classical myths and literature of ancient Greece. The resulting songs and duets reveal levels of fantasy and nobility rarely found among Schubert’s nearly 700 lieder. As performed by renowned artists soprano Susanna Phillips, bass-baritone Shenyang, and pianist Brian Zeger, these memorable pieces will come as a revelation to lieder fans. Listeners who revisit the “lost world” of Greek antiquity in this recording will revel in its deep, three-dimensional splendor: the combined genius of Schubert, two legendary poets, and three marvelous musicians.